Your physician benefits from your loyalty; you should benefit as well. At Advanced Aesthetic & Laser Surgery, we offer a loyalty program, which benefits our patients who return to our office for Botox®, Dysport®, Juvederm®, and the Restylane® Injection treatments in addition to the loyalty program offered by Allergan for Botox® and Juvederm® treatments and Galderma for Dysport®, and any of the Restylane® products. 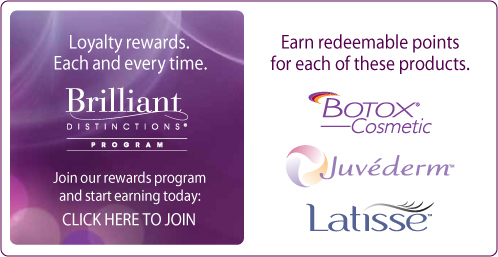 Allergan’s program in called ‘Brilliant Distinctions.’ Once you register as a patient on their website, we put in points for you every time you get a treatment of Botox® or Juvederm®. Before you come in for your next treatment, you can log on and print out a coupon for dollars off your treatment. Similarly to Brilliant Distinctions, Galderma's program is called Aspire where you can recieve points for injections of Dysport® or any of the Restylane® Family injections. You can also answer daily questions to earn more points for an even larger discount on your next injection. Our patients get a ‘frequent flyer’ card for fillers and neurotoxins. You get one punch for each area of Botox® or Dysport® and two punches for each full syringe of Juvederm®, or Restylane® injections. Once you get nine punches, your next area of Botox® is free or you next filler syringe is $225 off. Contact us to see how Dr. McMahan can help you get started the best injections for the best deal for your specific needs!